Listen to the Cancer.Net Podcast: Dental Health During Cancer Treatment, adapted from this content. Many cancer treatments have side effects that affect a patient’s mouth, teeth, and salivary glands. These side effects can make it difficult to eat, talk, chew, or swallow. Fortunately, with good care, you and your doctor can reduce the risk of these side effects and manage them if they do occur. Many of these side effects disappear shortly after treatment ends. Some might be long-lasting or permanent. Learn more about these side effects. Not all cancer treatments affect the mouth, teeth, and jaw. But the following treatments may cause specific dental and oral side effects. To learn more about your risk of experiencing these side effects, talk with a member of your health care team. Radiation therapy can change the amount and consistency of your saliva. This increases your risk of dental decay. To prevent dental decay, your dentist will likely recommend maintaining very good oral hygiene and special fluoride treatments during radiation therapy. This treatment, along with a low-sugar diet, can help protect your teeth. Your doctor or dentist may also recommend exercises to prevent stiffness in the jaw. Learn more about the side effects of chemotherapy. Stem cell/bone marrow transplantation. The high-dose chemotherapy that is usually given before a stem cell/bone marrow transplant may cause dental and oral side effects. These are similar to those described under “chemotherapy” above. Mouth sores are a common side effect of high-dose chemotherapy used to treat leukemia, lymhoma, or multiple myeloma. Patients receive this high-dose chemotherapy before a stem cell transplant. The U.S. Food and Drug Administration approved the drug palifermin (Kepivance) to prevent treatment-related mouth sores. Patients receive palifermin through an intravenous (IV) tube placed into a vein before the transplant. Learn more about the side effects of stem cell transplantation. Bone-modifying drugs. Medications such as bisphosphonates and other newer drugs are sometimes used to reduce the spread of cancer cells to the bone. An uncommon but serious side effect of these medications is osteonecrosis of the jaw (ONJ). ONJ causes weakening and loss of bone in the jaw. This can result in pain, swelling, and infection of the jaw; loose teeth; and exposed bone. To help prevent ONJ, visit a dentist before starting treatment to make sure that your mouth is healthy. Find more information about bone-modifying drugs for breast cancer and bisphosphonates for multiple myeloma. New types of drug therapy. New, effective medicines to treat cancer are being developed all the time. Some of these, called targeted therapies, target specific steps in cancer development. Targeted therapies also have side effects, some of which can affect the mouth. For example, drugs called mTOR inhibitors may cause canker sores, a type of mouth sore. Canker sores can be treated with certain gels or rinses prescribed by your health care team. Other medications. Other medications that help manage cancer symptoms and side effects may also cause dental and oral side effects. For example, pain medications can cause dry mouth. And some mouth rinses that are used to treat infections may discolor teeth. Patients who have good dental health before treatment have a lower risk of these conditions. Therefore, it is important to see a dentist at least 4 weeks before starting cancer treatment. Ask your dentist to share details about your oral health with your cancer doctor. This way, both doctors can work together to plan your care. Typically, you should allow at least 2 weeks for healing between dental surgery and starting cancer treatment. You should also talk with your dentist or another member of your health care team about which mouth problems you should tell your dentist about right away. If you’ve started your cancer treatment and haven’t seen a dentist, see one as soon as possible. Gently brush your teeth 2 times a day and floss regularly. Soak an extra-soft toothbrush in warm water to soften the bristles before brushing. Try using a child-size, soft toothbrush if your regular brush is too bulky or uncomfortable. Your doctor may also give you special instructions to reduce the risk of bleeding and infection. Also, ask your dentist if you should use a fluoride gel or rinse. Promote good bone health. Getting enough vitamin D and calcium each day helps your jaw and teeth stay strong and healthy. Dairy products are good sources of calcium and, if fortified, vitamin D. Other food choices may include fortified fruit juice and fortified breakfast cereals. Talk with your health care team before taking any supplements. If you experience any dental or oral side effects during treatment, let your health care team know right away. Relieving side effects is an important part of cancer care and treatment. This is called palliative care or supportive care. Mouth rinses that contain salt and baking soda may help treat mouth sores. However, if you are taking high blood pressure medication, you may need to avoid mouth rinses with salt. There are also a variety of prescription rinses that may soothe sore spots. Pain medications, including narcotics, may also be used to treat pain from mouth sores. Medications may be placed directly on the sores, taken by mouth, or given through an IV. Antibiotics, antiviral drugs, and/or antifungal drugs are used to treat infections. Drinking water and sugarless drinks may help manage dry mouth. Sucking on ice chips may also help. Avoid things that will dry out the mouth, such as soda, fruit juice, cigarettes, chewing tobacco, and alcohol. Medications that produce saliva may help some people prevent or minimize dry mouth. Topical oral gels or other medications may help dry mouth caused by radiation therapy to the head and neck. Did You Know that Cancer Treatment Can Affect Your Mouth? 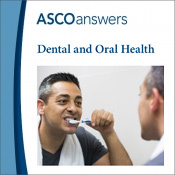 Download ASCO's free 1-page (front and back) fact sheet on Dental and Oral Health as a printable PDF.